Chime Lodge is located on the boundaries of Lanin National Park, that offers a majestic landscape throughout its almost 1.5 million acres and dominated by Lanin Volcano a peak of 11.300 ft adorned by snow and dry lava. This area has more than 20 trout rich lakes that feed a network of rivers that every year attracts the attention of fly fishermen from all around the globe. The main river in the area is Alumine which receives water from lots of tributaries like the Pulmari, Quillen, Ruca Choroi, Malleo, Pilo lil and Catan lil. 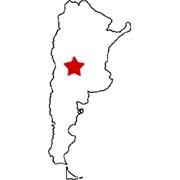 It is at its confluence with the Catan Lil where the Alumine is renamed Collon Cura which also receives water from the Chimehuin, Quemquemtreu and Caleufu Rivers until it drains into Piedra del Aguila Reservoir. 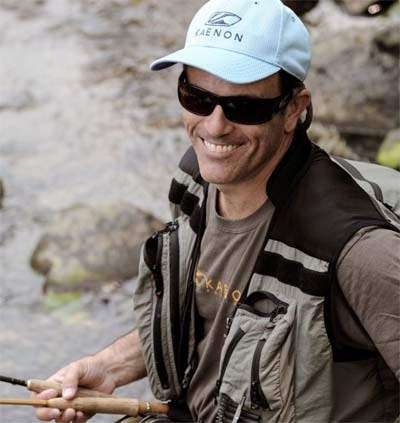 The fabled Chimehuin River is the most famous of all Patagonian rivers and home of endless stories of the monster trout that live in its productive waters. 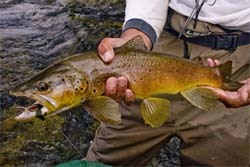 The Chimehuin is born on Lake Huechulafquen and flows for 40 trout rich kilometers until it meets Collon Cura River. The Chimehuin, also referred as “the Cathedral of Patagonia Fly fishing” is the place where fly fishing in Patagonia begun. Made famous by Joe Brooks and other fly fishing gods during the ‘60’s, the Chimehuin put Patagonia on the fly fishing maps of the world. The mythical mouth or “Boca” gather fishermen from all around the world to catch the gigantic trout that every year migrates from the lake to the river to spawn. 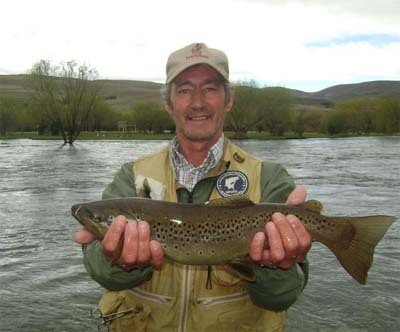 The Chimehuin is very productive with all fly fishing techniques be it dry, nymph or streamer and every corner may give you the fish of a lifetime. We can float right from the Lodge or drive and wade the many productive pools the Chimehuin has to offer. About 20 km from Chime Lodge you’ll reach the mid reaches of the Malleo River. 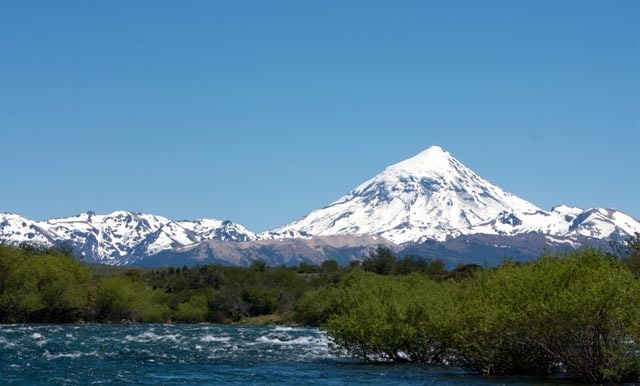 Regarded as one of the top 5 rivers in Patagonia, the Malleo is born on the very productive Lake Tromen on the northern foothills of Lanin Volcano. 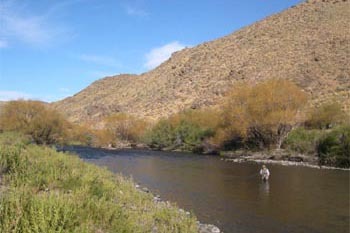 The upper parts of this river are very difficult to fish due to heavily dense vegetation, high banks and steep gradient. Although difficult to fish and moody, this upper part is home of some large resident fish and migratory rainbow and brown trout. We will concentrate on the lower reaches until its confluence with the Alumine River; on the Mapuche Indian Reservation; where it is easily waded, has abundant hatches throughout the season and holds large numbers of rainbow and brown trout. It is a dry fly paradise! 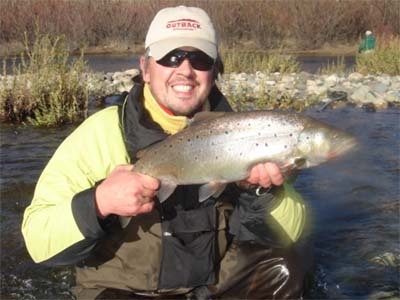 You can fish all day long different pools and runs sight fishing for the largest trout of the pod. It is also a river that will reward the streamer fishermen with large brown trout, especially during low light conditions. 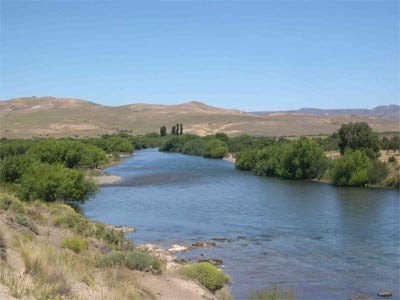 The super productive Collon Cura River is born from the union of the Chimehuin and Catan Lil Rivers and flows for about 70 km until it reaches the Piedra del Aguila Reservoir. 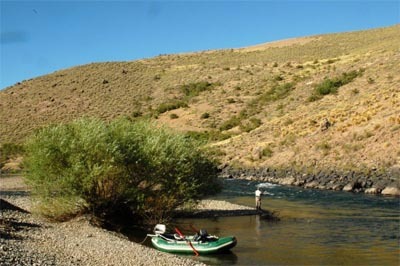 Besides the undisputed quality of the fishing, this is the place where its possible to see the unique wildlife from Patagonia. Just look up and you’ll see condors, eagles, ducks, falcons and raptors. Look to the banks and you may spot red deer, red and grey foxes, guanacos, rheas, otters and more. 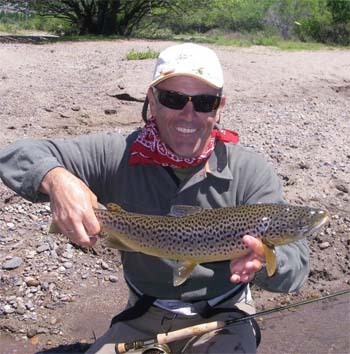 Due to the proximity to the reservoir, it’s a great river to Spey cast large streamers in search of large migratory brown trout (landlocked version of Rio Grande’s sea run browns), especially early and late in the season. 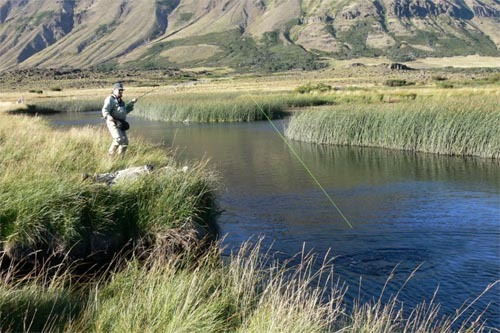 For the angler who’s done it all and wants to catch that extra fish there are Percas and Pejerrey Patagonico in abundance, especially during warm summer days. The Alumine river is born in the homonymous lake and flows for 160 trout infested waters until it meets the Catan Lil River and forms the Collon Cura. The most productive stretch is downstream from Pilo Lil all the way to Catan Lil. This is the place most guides call “the fish factory” were large concentration of trout feed on well marked lanes or below the ever present willows that cover its banks. It is not uncommon to hook 50 + fish on a day’s float, with impressive average size fish that will attack a well placed dry fly. 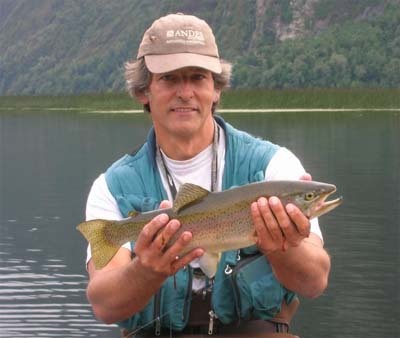 Even though you may fish dries and nymphs all day long for 18” fish, swinging a streamer deep into some pools may give you some trout measured in lbs not inches. Hook in and hang on! 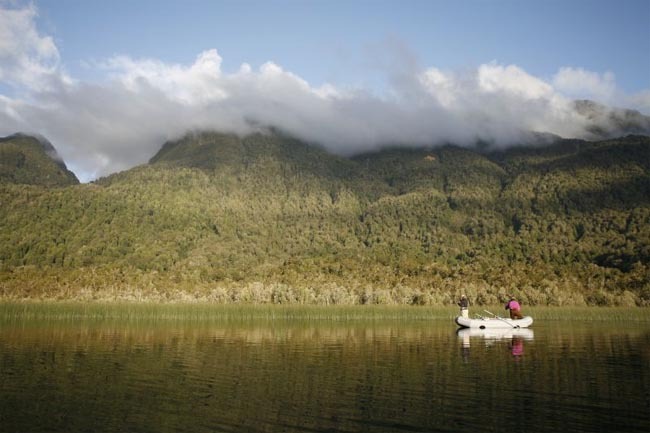 This is also the place where you will hook and land our native fish called Perca. The stretch from Pilo Lil to its confluence with the Malleo is the place we choose for our multi day float trip. The Caleufu is another medium sized tributary of the Collon Cura River.and born from the union of the Filo Hua Hum and the Meliquina Rivers. 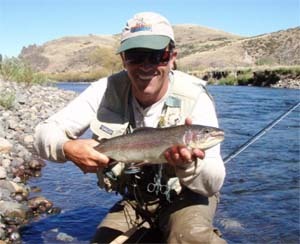 It is a great early and late season river due to the proximity to the Piedra del Aguila reservoir. It can be floated up until the end of February. During certain times of the season we may choose to fish other streams. There are many tributaries Quilquihue, Curruhe, Quemquemtreu just to name a few) to the previously mentioned rivers that fish really good at one point or another. These smaller streams are an excellent choice for the wading angler who wants to fish light line rods (1 to 4 wt) for lots of hungry small to medium sized trout or landlocked salmon. Bamboo rod aficionados will find in these streams their wildest dreams. If small water is what you want these are the streams of your dreams. 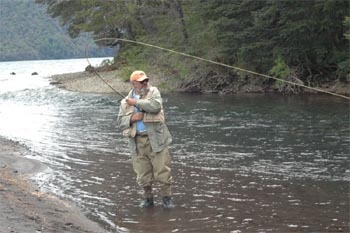 Lake fishing is a favorite passtime among Argentine fly fishermen, why? Simply because its fun and challenging and most of all, you can catch a trophy trout every time, be it brown, rainbow or brook. Over the years we have asked our clients to fish Tromen, Huechulafquen, Epulafquen, Verde, Curruhe and other lakes around our area that are simply spectacular to the eye but also hold the underwater hidden creature we always dream we could catch. Gustavo Sarthou (Gus) - Lodge manager and head guide extraordinaire. No matter what you ask from him, he'll make it happen! Jonathan and Sarah Heames - We are glad to have recruited Jonathan and Sarah Heames as Hospitality Managers, customer service and business development for Chime Lodge. 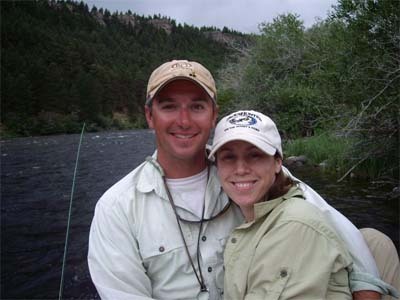 Jonathan has 16 years of guiding on waters of southwestern Montana, Yellowstone National Park, and the Henry's Fork, as well as 4 years in southern Chile and Sarah worked on Bar N Guest Ranch in Montana, and Isla Monita Flyfishing Lodge in Chile, currently she works as Assistant Manager at the Henry's Fork Lodge in Island Park, Idaho. Christian Olsen - Marine Biologist by trade and a passionate guide. His family came to Patagonia from Norway on the early 1800's. Aldo Rodino - Aldo literally grew in the banks of the Chimehuin River and has fished the area for more than 30 years. He is one of the hardest working and friendliest guides in Patagonia.